The Nepal at the east, Gangetic plans at the south, Tibet at the north and Himachal Pradesh at the west, Uttarakhand is bestowed to be a jewel of India. Being the source of several prominent rivers, it is home to some of the finest Uttarakhand hill stations whose glory has the power to leave anyone awestruck. Standing tall at an elevation of 2,084m, Nainital has become a synonym to hill stations. This place was first identified by the British during their rule and later they declared it as the ultimate holiday resort. Till today visitors capture the same essence and beauty which was back then. Nainital imbibes the picturesque of Kumaon and is surrounded by the seven mighty mountains that are popularly known as “Sapta Shring”. Major attractions here include Nani Peak, Naini Lake, Kilbury, Land’s End and a lot more. The best time to visit Nainital is during March to May, where travelers can enjoy a pleasant weather. The nearest railhead is Kathgodam which is 35kms away and the nearest airport is Pantnagar situated at a distance of 71kms. Whether it’s the geographical location, the spectacular aura or the amazing density of forests; no matter what the reason is, Dehradun is indeed one of the most loved hill station in Uttarakhand. It is located at the foothills of Himalayas, showcase breathtaking view of lofty mountains with river Yamuna and rive Ganges on the either sides. Apart from its natural beauty, the place even enwraps historic architectural monuments such as Tapkeshawar Temple and Mindrolling Monastery. The best time to plan a visit to Dehradun is in-between July to September where you can unleash the rain washed magic of the city. It has a well connected railhead present 2kms away from the centre and the Jolly Grant Airport, which is 20kms away from the centre. Embarked as the “Queen of Hills”, Mussoorie magnetizes travelers from different parts of the world. This city rests at an altitude of 1,880m providing an unforgettable view of snowcapped mountains, ravines and thick tropical forest that would linger in a nature lover’s heart forever. The enticing greenery and impeccable wildlife has made is a popular destination for nature & wildlife enthusiasts and even for couples who are looking for an romantic escapade. The best seasons to be here are from September to November and then from March to June, avoid visiting during extreme winters. To travel to Mussoorie you can count on its nearest railhead i.e. Dehradun present 34kms away and the nearest airport is Jolly Grant Airport which is 55kms away. Part of the Pauri district, Lansdowne is the place that nurtures un-spoilt, vast and rich flora and fauna; making it an ideal choice for travelers who are in the search of solace and tranquility. The vivacity of this hill station is encored by the Himalayas- world’s most beautiful and highest mountain ranges. The unseen exuberance of nature and its purity has made it a irreplaceable aspect of the list of hill stations Uttarakhand. Maximum visitors arrive at Lansdowne during the peak of summers from March to June. The nearest railhead is Kotdwar which 40kms away and the nearest airport is Jolly Grant Airport that is about 152kms away. There are well connected roadways via Delhi, Bijnore, Meerut and Najibadad. The woody smell of oak and deodar, the snowcapped mountains and the delightful apple orchards; these are the three pillars that together form Auli. This hill station is typically for the adventure lovers who want to unleash the best of winter sports at a remarkable destination. From skiing, trekking till hiking, each and every sport gets a new dimension at Auli. The highlight of this place is panoramic view of the Great Himalayas from the Gandola. Majority of the tourists plan their trip to Auli during winters in the months of November to January. The nearest railhead to this destination is at Dehradun which is 160 km away and the nearest airport is the Gauchar Airport (GAD) that is 90 km away. Situated at the banks of Alakananda River, in the lap of Himalayas is one of the holiest pilgrimage centers of India- Badrinath. It is present at an height of 3,100m and is reckoned to be the spiritual gateway for Hindus. However, the main focus of this place is not only the temple but even the magnificent greenery and hills that make it a treat for the eyes. Other popular areas of Badrinath are Mata Murti Temple, Neelkanth and Panch Prayag. The best time to be at Badrinath is from May to November, this is regarded to be the right time for sightseeing. The nearest railhead from this hill station is Rishikesh (297kms), Kotadwar (327kms) and Haridwar (324kms). The nearest domestic airport is Jolly Grant Airport which is 312 km away. Admired as the best hill station in Uttarakhand by nature lovers, Valley of Flowers is indeed a feast of flowers dancing at the tune of nature. Recognized to be one of the potent World Heritage Sites, it is seated at an altitude of 3658 m and enriches an area of approximately 87.50 sq. km. of Alpine flowers. The multihued flowers attract the attention of botanists every year. Some of the peculiar species of flora are Blue Poppy, Cobra Lily, Brahmakamal and a lot more. The best season to visit Valley of flowers is from June to October. The nearest railhead from this hill station is at Rishikesh which is 273 km away and the nearest airport is the Jolly Grant Airport that is at a distance of 297 km. Ranikhet is present in Almora district and has turned out to be one of the must-see summer destinations of India. Its bewitching topography, trekking trails and rare species of flora and fauna have made Ranikhet what it is today- home to the finest Uttarakhand hills and never before seen flowers and animals. There are several organizations which conduct trekking and hiking camps admits the tropical and serene forests. The best time to travel to Ranikhet is in-between March and May. The nearest railhead to this location is Kathgodam (68kms) and the nearest airport is Pantnagar Airport (120kms). After Ranikhet comes the well acclaimed land of Almora that shelters a rich landscape and cultural heritage. The hill station is formed in the shape of a horse-shoe at the edges of Kasaya Hills and thus resides at an altitude of 1638m from the sea level. The well known sightseeing places of this Uttarakhand hill station are Kasar Devi, Jageshwar, Golu Devta and Kataramal. The best season to arrive at Almora is from May to July. The nearest railway station is Kathgodam which is 38kms away and the nearest airport is Dehradun Airport 173kms away. The pristine land of Gangotri is a lot more than just a worshipping area, rather it is the heart and soul of Ganges. Almost 19kms apart from the central town, the Gangotri glacier melts at Gaumukh giving birth to the pure and divine Ganges. This is the reason why it has an integral place as the hill station of Uttarakhand. The best time to plan a trip to Gangotri is between April to June. The nearest railhead to the town is 119kms away in Rishikesh and the nearest airport is 199kms away in Dehradun. Pangot is a beautiful hill village, which is located in Kosiyakutoli of Nainital district in Uttarakhand. This is one of the most important tourist places which is located at the height of 6,000 feet. The popular hill station is situated at 15 km from Nainital. The hill station is famous for dense forests of Cheena Peak range, snow view point and a famous birding spot Kilbury. There are around 580 bird species have been recorded in this area. This is one of the most beautiful hill station to visit in Uttarakhand. Abbot Mount is beautiful hill station which is surrounded by clean and serene environment in Himalayas Range. It is situated at 6400 ft above from sea level. This place is famous for bird watching, trekking and photography in dense forests of Deodar and pines. It is one of the best hill stations and sightseeing points to see in Uttarakhand. It is a beautiful hill town, located in Nainital district of Uttarakhand, which is situated at an altitude of 1370 meters above from sea level. It is one of the major tourist spots of Uttarakhand and famous for Bhimtal lake. It is the best tourist place and sightseeing points to visit in Uttarakhand. It is a town of Nainital district of Uttarakhand and located at 1,654 meters above from sea level. It is a main gateway to many places in Kumaon division. It is a perfect hill station and surrounded by so many lakes like Bhimtal, Sat tal, Nal Damyanti Tal etc. It is one of the best hill stations to see in Uttarakhand. 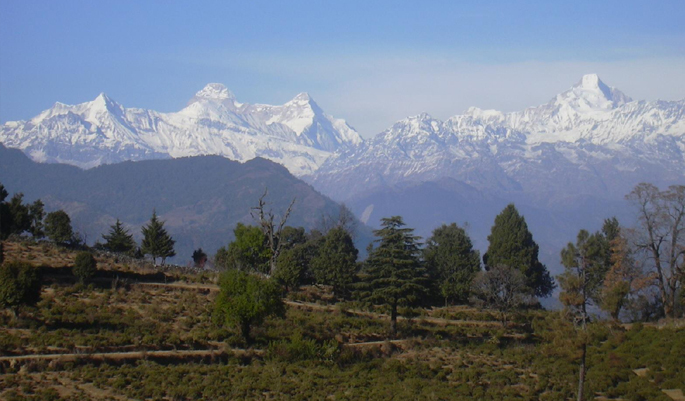 Binsar Wildlife Sanctuary is situated at the peak of Jhandi Dhar hills of Himalayas range. It is located at around 33 km from Almora town of Uttarakhand. You can enjoy the beautiful scenic view of Himalayan peaks like Kedarnath Peak, Shivling, Trisul and Nanda Devi from here. The sanctuary is covered over 45.59km square of area and at the height of 2412 meters from Almora town. This is the best tourist place and hill station to visit in Uttarakhand. Chakrata is a hill town and cantonment in Dehradun district of Uttarakhand. It is situated between the Yamuna and Tons rivers. The town located at 7000 to 7250 feet above from Dehradun. It is one the most beautiful places and hill station in Uttarakhand. It is one of the popular hill stations, situated in Pithoragarh district of Uttarakhand. It is situated among the lofty peak of Western Himalayan range. It is offers the beautiful panoramic views of snow peaks of Nanda Devi, Nanda Kot and Panchchuli group. It is also a sacred place and pilgrim of Hindu religion and one of the most beautiful hill stations to see in Uttarakhand. The beautiful village is located in Uttarakhand. It is famous for trekking to Tunganth, which is a third temple of Panch Kedar. It is one of unspoiled natural destinations which lying on the lap of Himalayas Range of Uttarakhand. It offers scenic views of Nanda Devi, Trishul and Chaukhamba. It is located at 2,680 ft above from sea level. The village is surrounded by dense forest of pine and deodar trees. It is the greatest hill station to visit in Uttarakhand. Dhanaulti is a beautiful hill station of Uttarakhand, which is situated at 24 km from Mussoorie. It is situated at 2286 m above from sea level. The hill station is famous for its peaceful environment, alpine forest of Deodar and Oak. The famous attraction of Dhanaulti is ECO Park, Surkanda Devi Temple and Aaloo Khet. It is one of the best tourist spots and hill station to visit in Uttarakhand. Didihat is a hill town of Pithoragarh district of Uttarakhand. It is surrounded by Himalaya Range and famous for ancient Shirakot temple, which is dedicated to Lord Malaynath. This is the best tourist spot and hill station of Uttrakhand. Gvaladam is a popular hill station, which is situated between Garhwal and Kumaon in Uttarakhand. It is located at 1,940 metres above from sea level. It is covered by deodar trees which makes wonderful scenic view. This is the one of the best hill station to visit in Uttarakhand. It is a beautiful hill town and cantonment area, which is located on the bank of Bhagirathi River. It is situated on the height of 7,860 ft from sea level. It is one of the popular and sacred pilgrimages for Hindu religion. It is one of the best tourist places to visit in Uttarakhand. 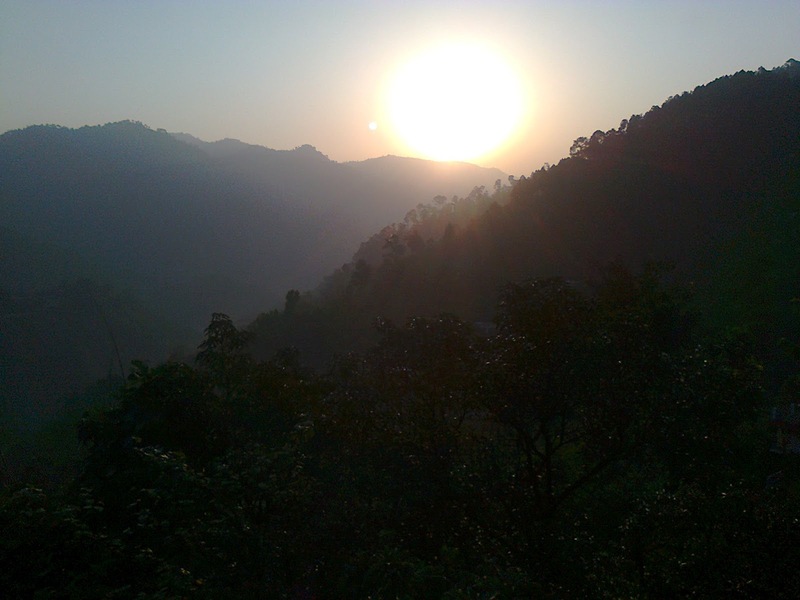 Jeolikot is a hill station which is located on the Nainital-Haldwani highway in Nainital district of Uttarakhand. It is situated on 1219 m above from sea level. It is a perfect place for nature lovers. Swami Vivekananda and Guru Aurobindo Ashram is located here where you can experience the art and power of Meditation. It is one of the perfect hill stations to visit in Uttarakhand. Kanatal is a beautiful hill station and city of Uttarakhand. It is located at 78 km from Dehradun of Uttarakhand and 37 km from Mussoorie from Himachal Pradesh. It is situated at the height of 2,590 m from Sea Level. It is surrounded by Himalaya range. Kanatal offers the beautiful scenic view of snow covered hills of Himalaya. It is also famous for a popular Surkunda Devi temple, which is located at a height of 9,995 ft. It is one of the best hill stations to visit in Uttarakhand. Kausani is a hill town, which is located in Bageshwar district of Uttarakhand. It is 52 km away from Almora. It is surrounded by Himalaya range and offers the beautiful panoramic view of Himalayan peaks like Trisul, Nanda Devi and Panchchuli. The hill town is covered by dense pine trees. It is one of the most popular hill stations to visit in Uttarakhand. It is one of the popular hill station located in the Pauri Garhwal district of Uttarakhand. It is located on 1700 mts above from sea level and covered by Oak, Deodar trees and apple orchards. The hill station offers the most beautiful panoramic view of Himalaya range. It is the best tourist spot in Uttarakhand. This is one of the most popular hill stations of Uttarakhand, It is a hill town which is located in Champawat district of Uttarakhand. It is located on the bank of Lohawati River. It is located at 1706 above from sea level. The hill station is also famous for its beautiful temples. It is one of the best tourist places in Uttarakhand. Mukteshwar is a hill town and famous tourist place located in Nainital district of Uttarakhand. It is situated on the peak of Kumaon hills of Himalaya range at altitude of 2900 meters. The beautiful hill station is mainly famous for a 350 years old temple ‘Mukteshwar Dham’, which is dedicated to Lord Shiva. It is famous for rock climbing and rappelling, and amazing view of valleys. It is one of the best hill station and perfect tourist place in Uttarakhand. It is small hill town, which is located in Pithoragarh district of Uttarakhand. It is situated at the base of Himlayan mountain range, at 2,200 m above from sea level. It is situated on the bank of Goriganga river and offers the beautiful view of combination of mountains, river and snow. It is also known as ‘Place with Snow’. It is one of the amazing hill stations and best tourist place to visit in Uttarakhand. Naukuchiatal is a hill station, which is situated in Nainital district of Uttarakhand. It is also known as ‘lake of nine corners’. The lake situated at 1220 mts above from sea level and around 175 feet deep. The hill station surrounded by hills, and covered by trees and shrubs. It is the perfect picnic spot and famous for paragliding, fishing, rowing and other adventures activities. It is one of the best sightseeing places to visit in Uttarakhand. Pauri is a beautiful hill town which is located in Pauri Garhwal district of Uttarakhand. It is located at 1,814 metres above from sea level. It is offers a beautiful panoramic view of snow covered Himalayan peaks of Nanda Devi, Trisul and gangotri group. It is the perfect place for trekkers, paragliding enthusiast and nature lovers. It is one of the best tourist places and hill station of Uttarakhand. Pithoragarh is a beautiful district of Uttarakhand, which is situated on the lap of Himalayan Mountain. It is surrounded by Himalayan Mountains, snow capped peaks, valleys, forests and waterfalls. It is also famous for so many temples and ruined forts. It is the best tourist place and hill station to visit in Uttarakhand. It is a small hill station which is located on the way to Mukeshwar in Nainital district of Uttarakhand. It offers the snow capped ranges of Himalayas. It is located at 1,400 meters to 1,900 metres from sea level. It is one of the best sightseeing points and best tourist place to visit in Uttarakhand. Sattal also known as Sat Tal or Seven Lakes is a group of freshwater lakes, which is situated on the lap of Himalayan range near Bhimtal of Nainital district. The interconnected group of seven lakes are set among dense forest of pine and oak trees. It is a perfect hill station to see in Uttarakhand. New Tehri is a beautiful city and hill station located in Tehri Garhwal district of Uttarakhand. It is located at 1,750 m above from sea level. It is surrounded with mountains and and lakes. It is one of the most beautiful hill stations and sightseeing place to see in Uttarakhand. Chamoli is a beautiful district of Uttarakhand. It is the second largest district of Uttarakhan. Chamoli hosts many destinations of Pilgrim and tourists interest. It lies in the central Himalayas and surrounded by Uttarkashi from northwest. You can see panoramic view of young Himalaya from here. It is one of the greatest hill stations to visit in Uttarakhand. It is one of the most popular hill stations and a pilgrimage of Hindu Religion. It is also known as Joshimath. It is located in Chamoli district of Uttarakhand. Jyotirmath located at 6,150 feet above from sea level. It is the perfect place for Himalayan Mountain climbing, trekking and a pilgrim centres like Badrinath. It is the best place to visit in Uttarakhand. Gangolihat is a small hill town, which is located in the Pithoragarh district of Uttarakhand. The Himalayan Hill town is famous for its Shakti Peethas of Hat Kallika which is dedicated to Goddess Kali. It is situated near Panchchuli peaks and Nanda devi of Himalaya Range. It is located at 1,760 metres above from Sea level. It is the most beautiful hill station and tourist place of Uttarakhand. Uttarkashi is one of the most popular sacred places for Hindu religion and a hill town, which is located in Uttarakhand. It is situated on the bank of Bhagirathi on the height of 1352 m above from sea level. It is also a home of ashrams and temples. Most of the area of Uttarkashi is hilly. It is one of the best hill stations to visit in Uttarakhand. Gopeshwar also known as Chamoli Gopeshwar is hill township, which is located in garhwal hills in Chamoli district of Uttarakhand. It is located around 1400 meters above sea level. The famous places of this town are Pt Dindayal Park, Kund, Gopinath temple etc. You can see many snow capped hills from here. It is one of the best hill stations to visit in Uttarakhand. Yamunotri is the famous pilgrimage of Hindu religion and a hill station which is situated at an altitude of 3,293 metres in Uttarkashi district of Uttarakhand. It is the source of holy river Yamuna. It is also one of the four sites of India’s Char Dhaam. The beautiful hill town is situated on the lap of Himalayan. It is one of the best sightseeing point to visit in Uttarakhand. Hemkund Sahib or Gurudwara Sri Hemkunt Sahib is a sacred Sikh place of worship and pilgrimage site, which is located in Chamoli district of Uttarakhand. The holy place dedicated to the 10th Sikh Guru, Guru Gobind Singh Ji. The beautiful pilgrimage site is surrounded by seven mountain peaks of Himalayas. It is one of the amazing hill stations to visit in Uttarakhand.